Well the days of summer are coming to and end. Coming to end, I am sad to say. I feel a bit of a panic set in. “Hi, Honey. How was your day. time left over to prepare a fancy gourmet meal, now does there. or take minimal effort after school. You like to do that too? These Creamy Chicken Tacos are seriously so yummy and easy. Just what you need on a busy weekday. The chicken is very saucy, creamy, flavorful…! Woo Hoo! It could be used as a dip, as well as a taco filling. YUM, is what we need on a school day every day! YUM, without a lot of fuss. Recipe created by Jamie Cooks It Up! 1 T maple syrup (Yum. Trust me. It adds a lot of yum…. 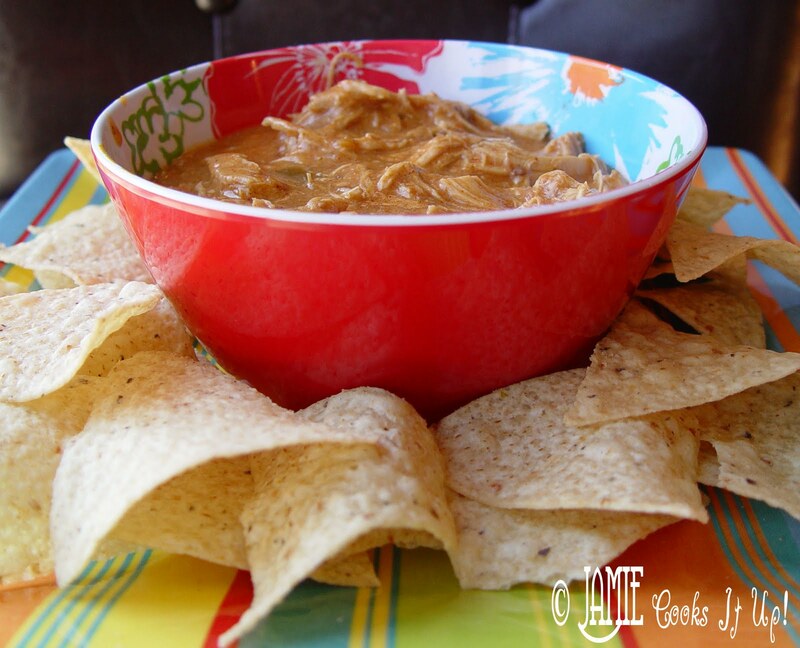 Serve over Tortilla chips or Tortillas. Top with tomatoes, onions, cheddar cheese, lettuce, perhaps a little cilantro, sliced avocado? Maybe we are gourmet after all! 1. Spray the inside of your crock pot with cooking spray and place the FROZEN chicken breasts inside. 2. In a small mixing bowl stir together all other ingredients but the butter and sour cream. 3. Pour the sauce over the top of the chicken. Cover and cook on high for 4 hours, or on low for 7-8 hours. 4. Take the chicken out of the crock and onto a plate. Shred it all up with a fork and throw it back in. 5. Add the little pat of butter and the sour cream, stir it all around until incorporated. 6. Cook for 1 more hour. Serve with chips and cheese. Or on a tortilla with taco fixins. Good luck with your after school chaos! Hi Jamie! Can this be cooked in the crock pot on low? I'm at work for 8 hours a day (as is my husband), so I love crock pot recipes that can sit on low all day while we are gone. Thanks! Yes you can cook it on low for 7-8 hours. Thanks for the question! Have a great one! Have I told that I want to be just like you when I grow up? You have the most wonderful recipes! I will be adding this one to the back to school menu. Thanks for your hard work! hahahhaa…..I don't know how you have time to blog! I love your posts, I don't always comment, but I do read them. So glad you guys liked it. Great idea with the chilies. I'll have to try that next time! I love crock pot meals! Thanks for this! YUM! The crock pot is seriously my best friend all year round. And I am making this tonight!! Going to go throw the chicken in it right now. So glad I took a moment to check out your blog. Thanks for the great recipes. Keep them coming! Sounds really good and easy! One the family will like! Can I make this the day before Thanksgiving (today) wihtout any reheating issues? I can save crunchy onions until serving time but do you have any reheating suggestions? I made this for my family last night. It was a big hit. I'm going to use the leftovers tonight in a casserole. Thanks, for great new recipes! I made this Monday night and served it with your Mexican Rice Salad. Even my picky son who doesn't like spicy foods ate it. I also added roasted green chiles to the pot. I omitted the sour cream, and replaced one can of cream of chicken soup with cream of celery. Thank you for inspiring me to cook for my family again. I made this for dinner last night and it was a real winner. This is sure to be a family favorite – and a mom favorite, too, since it's so easy to prepare. This looks fabulous! Thanks for the idea! Another awesome meal – just had this for dinner! My family isn't big on all the veggies in the salsa – so I strained the salsa and used the flavorful juices! I made a half of the recipe and used a medium size crackpot. The last 20 minutes of the 1 hour part I headed 1/2 a bag of Trader Joes frozen corn. This was good as is. BUT then we made a casserole out of the mixture with a little sauce at bottom, then corn tortillas, then the chicken mixture, then cheese – repeated 3x and topped with tortillas and cheese – baked at 350 for 25 minutes, let stand 5-10 like a lasagna but mexican style – served with refried beans – very good! Thanks so much for the recipes and the inspiration! Made this last week, it was so YUMMY!!! This is a definite keeper and go-to for me now. I used the leftovers to make creamy chicken taco soup. So good too. Thanks for the great recipes. Hi Jamie- You always have great recipes! I was wondering if you have made this with cr of mush soup, or any other than cr of chx? I have a huge aversion to cr of chx soup, but think the recipe looks great otherwise! I haven't ever tried it with cream of mushroom. I bet it would still turn out pretty well. Let me know if you try it. Thanks! My version – thanks for sharing! I Love your blog! I tried this recipe but i use bottled chicken and put everything together in the crocpot for a hour and half and i know its going to be yummy for dinner..it smells so good..Thank you for your great ideas..i love them i look her for dinner ideas atleast 5 days a week.. Absolutely Wonderful. THanks again for an amazing crock pot recipe. My family LOVED this and soooooo easy. This recipe looks wonderful! Can't wait to try it. I was just wondering–and this may be a really silly question–if the maple syrup in the recipe needs to be real maple syrup. In our home we buy Eggo “Lite syrup,” which is definitely different than the legit stuff. So, will any kind of mapley syrup do or does it need to be the real deal? Thanks! Just use the stuff you have. Should be fine. Hey Jamie. I just have to tell you that I LOVE your blog! 2-3 of the meals I make each week come from your blog. Every Monday before I do my shopping I just jump on here to see what new recipes you've posted. 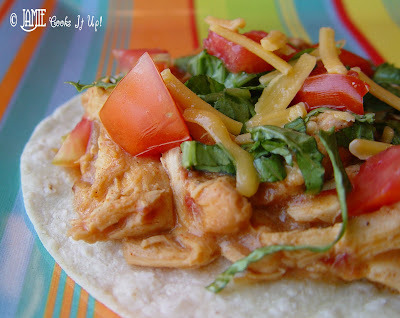 This creamy chicken taco recipe is one of my and my husband's favorites. It's so easy and SO YUMMY! I almost always have all the ingredients on hand so we make it all the time. Thanks so much for all your delicious recipes! this is delicious! My 20 month old and I ate all of it – a new favorite, once a week! I'm not familiar with taco seasoning that is either beef or chicken flavored. The McKormick brand I use doesn't specify. However, if you have a choice I would use chicken taco seasoning for this recipe. Good luck to you! Have you ever made this w/ green salsa? I haven’t, but have often wondered how it would turn out. Let me know if you try it and how it goes. I’m making this right now (with the green salsa) and wondering if the last hour is on low or high? Thanks! You just want the ingredients to get warmed through during the last hour. So, low or high would work fine…depending on how fast your crock pot cooks. Hope it turned out well! Sorry to be taking over on the comments. I made this with the green salsa and it was fabulous! Thank you for another yummy recipe! Is the Cream of Chicken soup two small or two family size cans? Thanks!! This was so good, and super easy! I love starting with frozen chicken, makes it faster, easier, and less messy. Seasoninwas perfect. We did think it was a little too soupy, but then we just used a slotted spoon to serve, and the remaining liquid was like a Mexican chicken soup. Yum! To shred the chicken I used the paddle attachment on my stand mixer, so that cut the bulk of the work out of the meal. Thanks for sharing! My crock pot will no longer collect dust! habe had this before, delicious! Just wondering if it was possible to make with raw chicken? Want to make it for dinner tonight but don’t have any frozen! What cooking times should I use? You can make it with regular (not frozen) raw chicken. It will cook just a bit faster for you, is all. Best of luck! Well, it’s been awhile since I made this. I love this recipe and is always a hit with the family. Unfortunately the recipe won’t load and all I get is multiple ads and website suggestions. Very disappointing. Thanks for your comment. So sorry the recipe didn’t load for you. Can you tell me what kind of device you are using to view the recipes? Are you on a computer or mobile device? Thanks for your help!